Six special award jerseys will be presented to the world's elite U25 cyclists who prove their mettle in the inaugural run of the 450-mile American Eagle Outfitters Tour of Pennsylvania presented by Highmark Healthy High 5®. The six-day stage race, June 24-29, is a first of its kind event and the richest race in the world for U25 riders, the sport's next generation of superstars. Beginning in Philadelphia and traversing a historically significant route along the Forbes Trail that was forged in 1758 by British General John Forbes and Colonel George Washington, the race culminates in Pittsburgh as part of that city's 250th anniversary celebration. In addition to Philadelphia and Pittsburgh, the Tour's host cities include Downingtown, Carlisle, Camp Hill, Bedford, Latrobe and Ligonier. The course route alternately favors sprinters and climbers, and now the 120 riders can vie for individual honors in these and several other categories with the six award jerseys, designed by American Eagle Outfitters and manufactured by California-based Voler Team Apparel. This jersey, presented by American Eagle Outfitters, will be awarded to the rider who has the lowest accumulated time across all six stages of the 2008 American Eagle Outfitters Tour of Pennsylvania presented by Highmark Healthy High 5 . Although a Leader's jersey will be awarded at the end of each stage, the true contenders know the only one that matters is on the final podium. The "maillot jeune," as it's collectively known, is the fought-after jersey that all riders want on their shoulders. The best climbers in the race will battle for "King Of The Mountain" points over all the decisive climbs of the course. Riders with high power-to-weight ratios will propel themselves as fast as possible to all summits, looking to scoop up as many points as possible against rival climbers. 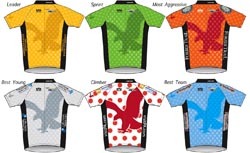 The rider who has accumulated the most King Of The Mountain Points will be awarded the polka-dotted Best Climber's Jersey, presented by VisitPA.com. For a select few riders, the pursuit of glory reigns supreme. This jersey is highly subjective and doesn't get awarded based on points, but rather honors the rider with the greatest tenacity. One active rider, no doubt, will impress with his unending resolve, making him worthy of wearing the 2008 American Eagle Outfitters Tour of Pennsylvania Most Aggressive jersey. Strategically placed, intermediate sprints will see teams ushering their top fast-man to the front to take maximum points. These sprints are often referred to as the "race within a race." Raw power and great positioning will reward only one rider with the famous, green Best Sprinter's jersey. Whoever said cycling isn't a team sport was wrong. This jersey proves that cycling is a collective use of power and wit. Six young riders, each with an appointed role, will work together from start to finish to achieve many goals. The Teamwork Jersey, presented by Pittsburgh 250, will be awarded to the team most capable of controlling the race and its outcome from Philadelphia to Pittsburgh. In a race of riders no older than 25, the Best Young Rider's jersey, presented by Highmark Healthy High 5, is a true testament to the next generation of cyclists. Look for the rider wearing this jersey to be as young as 17, but strong enough to snag points in the King of the Mountains, Sprinter or Overall points competition. The battle for the Best Young Jersey will be among an elite, international, Espoir field. Only one will go home with the Best Young honors. Currently, 18 teams have been selected to compete for the $150,000 Tour of Pennsylvania purse. They include seven international squads from Argentina, Australia, Belgium, Canada, Ireland, Netherlands and South Africa. Two additional international teams will be named to the field shortly. The 11 selected American professional and elite amateur teams are based in Arizona, California (2), Colorado, Minnesota, New England, New York, North Carolina (2), Ohio and Pennsylvania. A wait list has been established with the possibility of adding two more domestic teams if the field can be expanded from 120 riders to 132. The world's richest cycling race for elite international cyclists under age 25. The six day, 450 mile stage race takes place June 24 to 29 from Philadelphia to Pittsburgh, featuring 20 teams of six riders each (ages 18 to 24) from around the world. The tour is sanctioned by the International Cycling Union (UCI) and will feature future stars of the Olympics and Tour de France. The race offers a cash prize list of $150,000 and will be televised on the Versus cable network, broadcaster of major cycling events including the Tour de France. The Tour of Pennsylvania is being organized by Pittsburgh 250, sponsored by American Eagle Outfitters, the leading lifestyle brand among 15-to-25 year-olds and presented by Highmark Healthy High 5 a five-year, $100 million children's health promotion initiative of the Highmark Foundation. The initiative's goal is to improve the health of children and adolescents ages 6-18 by providing them with the tools and practices needed to live healthier lives by making informed choices. Highmark Healthy High 5 Finish Line Festivals (which are free and open to the community) will feature health and wellness expos, entertainment, games and prizes at each stage finish. The Tour of Pennsylvania is managed by Tour of PA, LLC, a partnership between ISM-USA of Pittsburgh and Pro Cycling Tour, LLC of Audubon, PA. For more information, visit www.tourofpa.com. The American Eagle Outfitters Tour of Pennsylvania, presented by Highmark Healthy High 5, is an important part of Pittsburgh 250, the celebration of the 250th anniversary of the naming of the region in 1758. With the support of business, government and civic leaders from across the region, Pittsburgh 250 has set three goals: Improve awareness of southwestern Pennsylvania as a global leader in arts, science and quality of life through an integrated regional marketing effort; support the completion of lasting signature projects that connect the region's past to its future; and improve the region's competitiveness for future generations by encouraging grassroots participation in improving communities, attracting visitors, and living healthier lives.